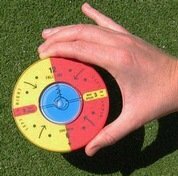 The FLPR or Fall Line Putt Reader is a color-coded training aid designed to help you find the Fall Line through the hole. Once you can identify the true downward direction of the slope through the hole, you will have a much better idea which way your ball will break as it slows down in its approach. Research shows that the use of color to distinguish the direction of the break has more impact that just printed words of instruction. When you place the FLPR at the hole and then step back to your ball, you can easily see the different colored hemispheres that show the direction of the break. The total visible surface provides usable information about the break, unlike other green reading devices that display advertising. The size of the FLPR is small enough to fit into your pocket, yet large enough to form a broad base to give an accurate reading of the green surface. Smaller green reading devices with narrower bases are more likely to be affected by an irregularity in the green surface resulting in a wrong reading. The FLPR is larger than the size of the actual hole as tests showed that there were problems with a unit that fitted into the hole. More accurate readings of the slope were obtained when it was placed by the hole. This is because the rim of the hole was often frayed or damaged, unless newly cut. The indication of slope from one to three degrees reflects the range of slope found around the hole for a fair hole location on a sloping green. Steeper slopes greater than three degrees would not allow you to stop the ball at the hole. The Fall Line Putt Reader is easy to use when you follow these three simple steps. Its main application is for putts in the range of four to five feet where there is a single slope. These are the putts that you want to make, and that cause you disappointment and frustration when you get the read of the break wrong. On longer putts outside of five feet there may be more than one slope as in the case of a double breaker. However, as the ball slows down it is the slope nearest the hole that is the most important. Position the FLPR alongside the hole so that is situated between the hole and your ball. The 6 arrow should face your ball and the 12 arrow the hole. Unless your ball is exactly on the local Fall Line through the hole the bubble will be either left or right of a straight line from the 12 to the 6. Rotate the FLPR until the bubble is centred over the straight line from the 12 to the 6. This now represents the Fall Line or the true downward direction of the slope through the hole. If you are mapping the green for various hole locations draw a small arrow on your green map to represent the Fall Line. The degree of slope can be marked next to the arrow. If you are merely practicing your putting, mark the high side of the hole with a ball marker and the low side of the hole with another. It helps to use different colored ball markers. Once you know the Fall Line, then all balls that are positioned on the Right (RED) side of the Fall Line will break right to left. Similarly all balls that are positioned on the Left (YELLOW) side of the Fall Line will break left to right. All other putts are either straight uphill or straight downhill. The amount of the break will depend on the degree of the slope and the speed of the ball as it approaches the hole. The steeper the slope, the more the ball will break. On the other hand the faster the ball-speed, the less the ball will break. Part of the skill of putting is matching the arrival speed of your ball at the hole with your read of the break. As you come to appreciate the significance of the Fall Line at the hole using the Fall Line Putt Reader, you will be able to anticipate how your ball will react with the green surface and the direction it will break. This will add to your putting confidence and your ability to make more makeable putts.